The truly remarkable Coiling Dragon Pendant features a three-dimensional dragon wrapped around a table tennis bat. 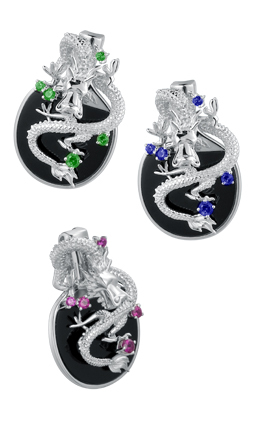 The Coiling Dragon Pendant is available in 18 ct gold or 925 silver and comes in three different stone options: created emerald (green), created ruby (pink) and created sapphire (blue). The surface of the table tennis bat is black onyx.